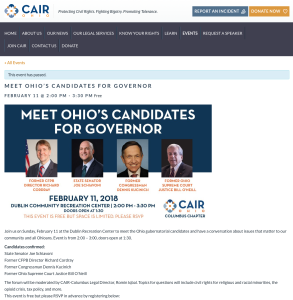 Hamas doing business as the Council on American Islamic Relations (CAIR) hosted an event in Columbus, Ohio yesterday for the Democrat candidates for Governor of that state. Participating in the Hamas/terrorist event were Democrats Richard Cordray, Joe Schiavoni, Dennis Kucinich, and Bill O’Neill. The event was hosted by Hamas (CAIR) legal director in Columbus Romin Iqbal. Evidence in the largest terrorism financing and Hamas trial in U.S. history – US v Holy Land Foundation for Relief and Development, Dallas 2008 (“HLF”) – identifies CAIR as the 4th organization created by the U.S. Muslim Brotherhood’s Palestine Committee which is Hamas in the United States. UTT’s Vice President Chris Gaubatz went undercover inside CAIR in 2008 for approximately 6 months and retrieved over 12,000 documents from CAIR’s headquarters revealing evidence of fraud, sedition, espionage, and terrorism. Read more about this in the book detailing Chris’ exploits Muslim Mafia. For more evidence that CAIR is Hamas click HERE. UTT has made inquiries to the FBI’s National Press Office asking: whether or not investigations have been opened into CAIR Columbus and its leadership; whether or not CAIR is being investigated for tampering with elections, sedition, material support for terrorism, and other charges; and if the Democrate candidates for Ohip Governor have been questioned or are being investigated for participating in the terrorist event. Thus far UTT has not received an answer to these inquiries. By virtue of having allowed their names to become publically associated for political gain with sharia-adherent Muslim terrorist organizations, it seems reasonable to assume that not only have Ohio’s four candidates for governor pictured above failed to uphold the foundational core of their oaths to protect and defend the Untied States from all enemies both foreign and domestic, but are lingering amid unspeakable malfeasance by ostensibly failing to acquaint themselves with the fact that Islam’s comprehensive declaration of war* on the United States even exists. *Anyone wishing to acquire a personal Arabic-to-English verbatim translation of Islam’s comprehensive & chilling declaration of war on the United States, which was seized from a subterranean basement in Annandale, Virginia by Special Agents of the FBI in compliance with a federal search warrant, in 2004, may do so (for a nominal handling & postage fee) by contacting: http://www.securefreedom.org to request: GOVERNMENT EXHIBIT 003-0085 3:04-CR-240-G U.S. v. HLF, et al.